Early in May 1861, twenty-one-year-old Sam R. Watkins of Columbia, Tennessee, joined the First Tennessee Regiment, Company H, to fight for the Confederacy. Of the 120 original recruits in his company, Watkins was one of only seven to survive every one of its battles, from Shiloh to Nashville. Twenty years later, with a "house full of young 'rebels' clustering around my knees and bumping about my elbows," he wrote this remarkable account of "Co. Aytch". 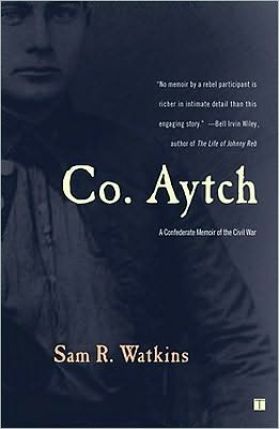 Co. Aytch by Sam R. Watkins. Early in May 1861, twenty-one-year-old Sam R. Watkins of Columbia, Tennessee, joined the First Tennessee Regiment, Company H, to fight for the Confederacy. Of the 120 original recruits in his company, Watkins was one of only seven to survive every one of its battles, from Shiloh to Nashville. Twenty years later, with a "house full of young 'rebels' clustering around my knees and bumping about my elbows," he wrote this remarkable account of "Co. Aytch" -- its common foot soldiers, its commanders, its Yankee enemies, its victories and defeats, and its ultimate surrender on April 26, 1865. "Co. Aytch" is the work of a natural storyteller who balances the horror of war with an irrepressible sense of humor and a sharp eye for the lighter side of battle. Among Civil War memoirs, it is considered a classic -- a living testament to one man's enduring humanity, courage, and wisdom in the midst of death and destruction. This book is required reading in Exploring America by Ray Notgrass. Click on the "Buy Together" tab for amazing savings on Exploring America literature packages!